• Prevents potential damage to your home – Sometimes, boilers can leak oil which not only causes significant damage and mess but can also smell. External oil Boilers – SEDBUK stands for ‘Seasonal Efficiency Data Base United Kingdom’. It is a government scheme introduced to encourage and ensure that the efficiency of heating appliances can be rated fairly across all manufacturers . The grades are A,B,C,D, or E with grade A representing the highest efficiency available at present. External – System Oil Boiler – A system boiler is basically an standard boiler, which includes the pump and expansion tank that are built into the external condensing oil boiler which allows you to have a “sealed heating system”, which has become the standard over the last 15 years or so. The benefits of a ” sealed system” are that no feed and expansion tank is required in the loft or at high level ( another benefit is that these tanks were prone to freezing or bursting at the most inconvenient time , often cause major water damage or resulting in a failed heating system ), and that the oil heating installation is made a lot more tidier, easier, and simplifies servicing of the external oil boiler, as everything is in one place , withing the boiler casing. External Combination or “Combi” Oil Boiler – A “Combi” or Combination Oil Boiler are the most popular installed oil domestic boilers these days in the UK, as the provide both heat for the central heating system and Domestic Hot Water ( sometimes referred to as DHW) , for washing and bathing with a household.This makes the external oil boilers extremely efficient as they only heat the domestic hot water when a shower or hot water tap is turned on, thus ensuring maximum efficiency. They eliminate the need for a domestic hot water cylinder or tank and the space required by it, not to mention the expense and also eliminate the need for a feed and expansion tank in the loft space. These Combi Oil Boilers, are a complete package , or complete external oil boiler system , in one unit, being simple to use, easy to install and economical to run, with plenty of domestic hot water , for you to enjoy a bath or shower.The Flow rate of these boilers is 12 to 14 Litres a minute, with a 50 Degrees C temperature uplift or rise. We do 2 models within our our range of External Oil Boilers – a 15 kW to 22kW Output model , or in BTU’s = 51,180 to 75,064 , this external oil boiler would normally be suitable for smaller semi detached or terraced properties and bungalows alike , but should you be in any doubt of what size boiler you require , please consult a heating engineer or plumber, for further advice. 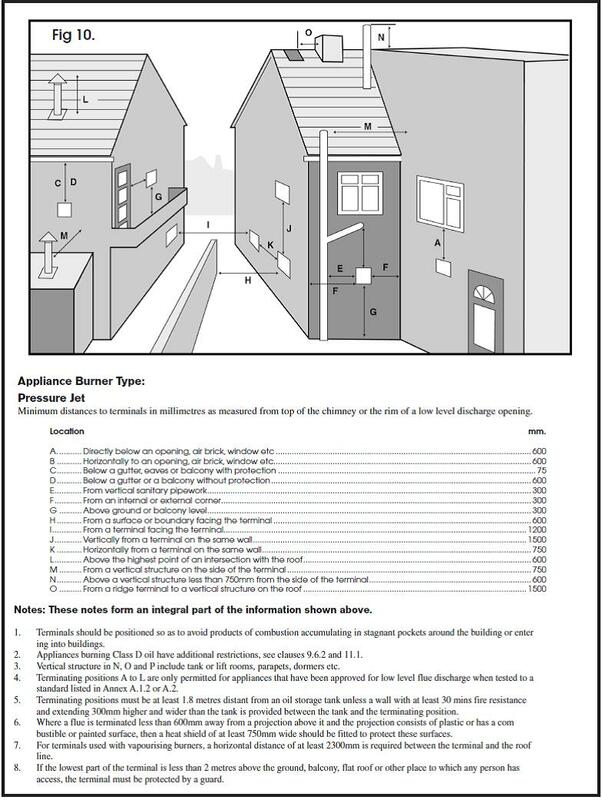 The large external oil boiler model is a 23kW to 28kW Output model , or in BTU’s = 78,476 to 95,536 , this external oil boiler would normally be suitable for Larger semi detached or terraced properties and larger bungalows alike , but again should you be in any doubt of what size boiler you require , please consult a heating engineer or plumber, for further advice. External condensing oil boilers have full load efficiencies of up to 93%. That’s up to 20% more efficient than an existing traditional oil boiler and potentially a 20% reduction in your fuel bills! They say a picture can speak a thousand words , and below you can see one of our external oil boilers , installed at high level , the ability to install our external oil boilers in a wall hung configuration , means that you place them in a variety of locations off the floor , which is a particular advantage for customers who live in a flood zone areas , as the boiler can be taken out of the “danger zone”. Another advantage of mounting the external oil boilers at this height is that they are out of the way of children , who have an awful habit of trying to feed the exhaust flue with various items such as twigs, straws and pretty much anything they can get their hands on ! and the third advantage is the the exhaust or flue gases are in free air , which means that you are less likely to smell any obnoxious smells / fumes from the oil boiler. All of our external oil boilers have been designed and manufactured to the following standards – OFTEC OFS A100, European Directives BED 92/42 and EEC LVD EN 60335-1 and EMC 89/33C/EEC and are WRAS approved. They are designed to burn Kerosene 28 Class C fuel – to British Standard Specification BS 2869 Part 2 Class C2 , European standard BS EN 2869:2010 Class C2, which are also referred to as Heating Oil, 28 Second Burning Oil or Central Heating Fuel. This grade of Kerosene has clean burning characteristics whilst maintain a high heat output and maximum fuel economy.